the delights he drew from this divine banquet. Now the company of those who believed were of one heart and soul, and no one said that any of the things which he possessed was his own, but they had everything in common. And with great power the apostles gave their testimony to the resurrection of the Lord Jesus, and great grace was upon them all. There was not a needy person among them, for as many as were possessors of lands or houses sold them, and brought the proceeds of what was sold and laid it at the apostles' feet; and distribution was made to each as any had need. "I am the true vine, and My Father is the vinedresser. Every branch of Mine that bears no fruit, He takes away, and every branch that does bear fruit He prunes, that it may bear more fruit. You are already made clean by the word which I have spoken to you. Abide in Me, and I in you. As the branch cannot bear fruit by itself, unless it abides in the vine, neither can you, unless you abide in Me. I am the vine, you are the branches. He who abides in Me, and I in him, he it is that bears much fruit, for apart from Me you can do nothing. If a man does not abide in Me, he is cast forth as a branch and withers; and the branches are gathered, thrown into the fire and burned. If you abide in Me, and My words abide in you, ask whatever you will, and it shall be done for you. By this My Father is glorified, that you bear much fruit, and so prove to be My disciples. As the Father has loved Me, so have I loved you; abide in My love. If you keep My commandments, you will abide in My love, just as I have kept My Father's commandments and abide in His love. These things I have spoken to you, that My joy may be in you, and that your joy may be full. "This is my commandment, that you love one another as I have loved you. Greater love has no man than this, that a man lay down his life for his friends. You are My friends if you do what I command you. No longer do I call you servants, for the servant does not know what his master is doing; but I have called you friends, for all that I have heard from My Father I have made known to you. Founder of the Society of the Blessed Sacrament, and of the Servants of the Blessed Sacrament, born at La Mure d'Isère, Diocese of Grenoble, France, February 4, 1811. From early childhood he gave evidence of great holiness and most tender devotion to the Blessed Sacrament. In 1829, he entered the novitiate of the Oblates of Mary, but illness compelled him to return home. At the age of twenty he entered the grand seminary of Grenoble, and was ordained priest July 20, 1834. He returned to the Marist novitiate in 1839. 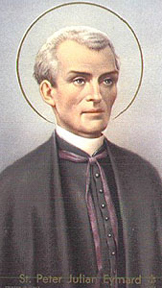 In 1845 he was appointed Provincial of the Oblates of Mary. His entire spiritual life was centered around the Eucharist. It was the subject of his sermons and exhortations, the object of his worship and prayers. Those who fell under his spiritual direction were taught by his counsel to fix their attention on the Blessed Sacrament. In January of 1851 Peter Eymard made a pilgrimage to the shrine of Our Lady of Fourvières, and there promised Mary to devote his life to founding a congregation of priests whose principal duty should be to honor the Blessed Sacrament. Having obtained the necessary ecclesiastical permission, he procured a small house in Paris, in which he and a single companion took up their abode. Here, on January 6, 1857, the Blessed Sacrament was exposed, and the nascent community of two members commenced the adoration of the Blessed Sacrament as prescribed by their rule. Their founder received his first encouragement for the work in a laudatory Brief, blessing the work and its author, and signed by Pius IX, in 1857. Five years after, in 1862, Peter Eymard had enough spiritual sons to open a regular novitiate. From this date the congregation spread rapidly, until now its houses may be found in Rome, Belgium, Holland, Spain, Canada, the United States, and South America. The Servants of the Blessed Sacrament, a congregation of cloistered women who carry on perpetual adoration in their convents, were also founded by him in 1858. The Priests' Eucharistic League and the Archconfraternity of the Blessed Sacrament are evidences of his zeal among priests and the faithful. Peter Eymard's writings have been collected, and form four volumes: "The Real Presence", which has been translated into English; Retreat at the Feet of Jesus Eucharistic", "La Sainte Communion", and "L'Eucharistie et la Perfection Chrétienne". These writings have received the approbation of the Holy See. He died August 1, 1868. The author was declared Venerable August 11, 1908 and canonized on December 9, 1962 by Pope John XXIII. Although there are several methods of meditation, St. Eymard suggests one is truly Eucharistic since it is taken from the four ends of the Eucharistic Sacrifice. The method is to divide Eucharistic Adoration into four quarters, Adoration, Thanksgivng, Reparation and Petition. He recommends preparing before going to church the subject of meditation and that one should be practical and consistent with his devotions toward God. According to St.Eymard the Stations of the cross was considered among the most important excercise of a retreat. He made the Stations daily until his death. Source My Eucharistic Day, Rules and Practices recommended by St. Peter Julian Eymard, Prow Books/Franciscan Marytown Press 1954.